Monthly Rental with a one bedroom apt with a kingsize bed and a small kitchenette. Livingroom has a duel reclining couch, ceramic floors, and a large flat tv with / Wi-Fi. Pots and dishes are provided. No need to bring anything. There is a large side yard with a back patio with a bbq grill, and your own washer and dryer. Duplex style property with all your own fenced private space. All the wonderful National parks are within a days drive, like the Grand Canyon 5 hrs or Zion 4 hrs, or Bryce 5 hrs. We have alot of knowledge about vegas, we have lived here 10 years having moved from the cold East Coast. I love to garden and my husband loves to golf and fish in nearby Lake Mead. We live in the main part of the home that has a lovely yard with grass and flowers. You can't get a home any closer to exciting Freemont Street area that is booming. Also there are many museums. This whole downtown area is being revitalized and there are a lot of exciting things happening here constantly. A little oasis within walking distance to all the excitement of Las Vegas. Nice updated bath. Their is a step up if you have any stepping limitations. Vintage neighborhood in walking distance to fabulous downtown las vegas and Fremont Street Experience also the newly developed east freemont street. Neon Museum, Mob Museum, and the new Smith Center. We had a wonderful experience and would do it again in a heartbeat. We spent 3 months in downtown Las Vegas at the Biltmore Bunglows. Our landlords, Linda and Gary, were the nicest and most helpful. They helped us find places to go and things to do as well as being the most wonderful people we have met in a long time. We would rent this place again and recommend it to anyone that are considering staying out west. We were able to walk to downtown and enjoy the Vegas experience. Clean and Organized! Quiet neighborhood, i enjoyed my stay up there. Will definitely come back!! Great property . 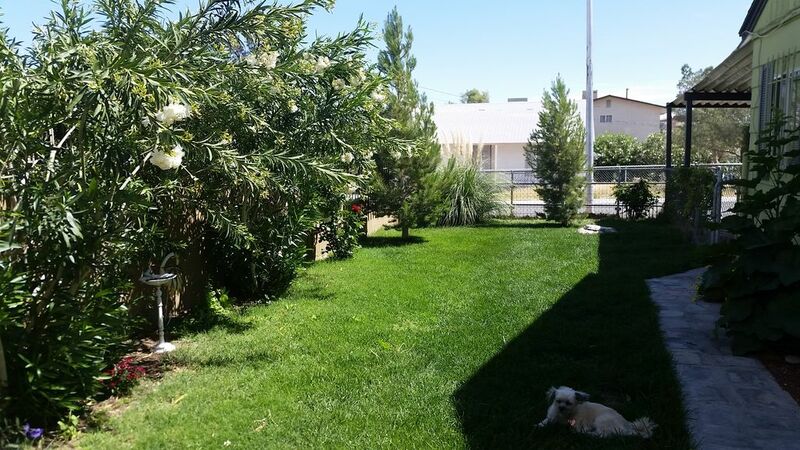 We were relocating & house hunting in the Vegas area ,stayed here for a little over a month in the middle the hot summer Family of 3 with two pets . We were comfortable and had everything we needed. We are JW (.org) so we don't gamble, but enjoyed the short walk to every kind of restaurant you can imagine. Owners were accommodating and were there if we needed anything 24/7 but also left us to ourselves like WE owned the place. It was peaceful yet in the middle of it all . If we hadn't move to the area now ,we would of been staying here again! Great little space, especially the garden & patio area- loved it! Only in the spirit of helping with some suggestions- a new mattress or a thick foam mattress cover- it sinks in the middle; foot rests for the couch to stretch out; maybe talk to neighbors about keeping their yappy dog inside when they leave-it really disturbed the peacefulness of the patio area; kitchen could use a spaghetti strainer, cucumber scrapper; tongs to take things out of hot water; drinking water Britta filter. Really loved our stay and meeting you. Loved the personalized welcome sign. Hope to stay with you again soon. Linda and Gary could not have been nicer to us. The bungalow is set in a beautiful yard with a sheltered back patio area where you can sit and watch hummingbirds visit the feeder and enjoy the chattering birds. We were able to walk to Fremont street every day, enjoying people watching and the liveliness. Linda has lots of recommendations of places to eat, shop, etc, but only if you'd like them. She even looked after our dog a couple of times and took the time to show me her gardens. We would highly recommend this property to anyone who doesn't want to do the old hotel thing. This was a perfect find for our needs- a true one-bedroom apt. with separate TV room/kid sleeping quarters, small kitchen and an impressive private garden for such an arid area. Relaxing over coffee in the cool, sunny fall mornings was a great way to recuperate from big-city fun that can be a little exhausting. Both mornings outside I was greeted by numerous hummingbirds and songbirds while enjoying the many flowering plants. If you're not out at night they have trellis lights above. As the photos show, the shower bath and kitchen are small but suited our needs with a full size fridge, microwave & 2 burner cooktop. The king bedroom is spacious and made room for our son on the floor without feeling cramped the one night a relative crashed on the pullout sofabed in the TV room. Location is a short walk to Freemont St., though women might opt to drive instead, as we did. The house is in a micro-sized modest neighborhood with some neighbors keeping up their property immaculately like this on and others not as much. Outside the neighborhood you are in an urban center until reaching Freemont St. area. The house is far enough away from I-515 to not have any freeway noise issues inside. Owners are super responsive living adjacent even checked in on us after hearing us arrive. We always prefer local owners or managers using VRBO if possible since the corporate managed places sometimes are fine and sometimes are slow to respond. Central location just two blocks from exciting Downtown Las Vegas! 30 minutes from Mt Charleston where you can hike or ski. Children under 10 are freeso bring the whole family when your here for business or convention. Also Lake Mead is 30 minutes away with lovely Hoover Dam and great striped bass fishing. Quiet vintage neighborhood in the heart of downtown. You will not have to worry about drinking and driving. Many casinos and restaurants are a short walk away. Main Street Station Casino has a wonderful breakfast buffet for 6 dollars and you can fill up and hit the strip for the whole day. Free bands on Freemont street at night and also in the new Container park on East Freemont. Area is being revitalized so their is alot of exciting new spots popping up. Their is a community olympic size pool just a block away with a gym inside if you want to work off all the buffet food. You can also rent chairs at the Golden Nugget and enjoy their beautiful outdoor pool. 777 Micro Brewry is two blocks away that has great beer and food at reasonable price ($1.75 fresh brewed pint including IPA's) and the sports are playing on all the monitors.